As a highschool student in the 90s, I remember the whole class celebrating if the teacher announced that we’d be watching a video for that lesson. We knew that videos were played mainly for entertainment or to give our overworked teacher a break, rather than for achieving a specific learning outcome. Flash forward to the age of MOOCs, Lynda training, Khan Academy and TED.Ed and it’s clear that video has become a fixture in the educational landscape. Yet with so many videos available online, as well as the increasing ease of producing your own, it raises the question of why we use video for learning and teaching? How can we best harness the unique properties of video to support student learning? As with any educational technology, it’s vital that the tech actually supports the intended learning outcomes. If you’re thinking about making videos for use in the classroom or as part of an online learning experience, it’s important to ask, what is the purpose of the video and how will it help students in achieving an identified learning outcome? Is video fit-for-purpose, or would another medium work better? In his presentation Potent Pedagogic Roles for Video, Jack Koumi discusses some of the unique properties or ‘affordances’ of video that create specific educational benefits. For example, video has the capacity to model real world situations, examples and skills, but can also be used to create visual metaphor or harness narrative power. Video can show things that aren’t accessible through everyday perception, such as extreme close-ups or slow motion. So a close-up or slowed down video could help to unpack a specific action like demonstrating how to give a safe injection. Koumi also discusses how video can operate in the affective domain by stimulating empathy which can be motivating for learners. For example, if you’re teaching verbal presentation skills, creating a video of a nervous communicator compared with a confident communicator will allow students to observe and analyse key behaviours such as body language and use of voice. Providing video content for students online means they can self-regulate and self-pace their learning. As videos can be paused, repeated, sped up or slowed down, students can choose how to direct their time based on their learning needs. This approach is championed by Salman Khan in his 2011 TED talk Let’s use video to reinvent education, where he advocates the ‘flipped classroom’ approach. In this model, traditional lecture material is recorded for students to watch as homework. 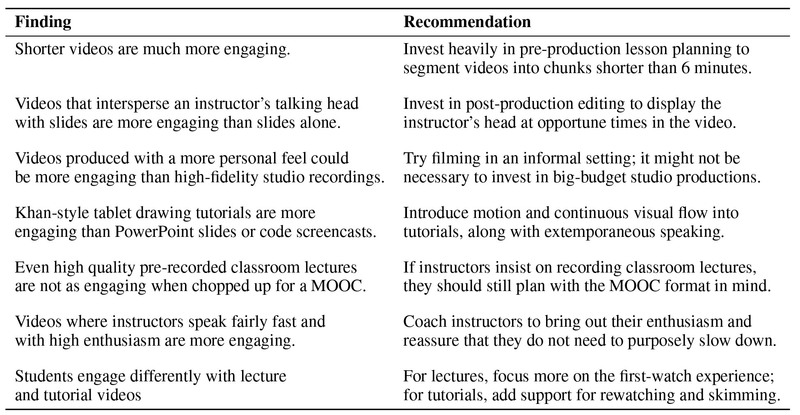 The ‘lecture’ time is then freed up for active learning where students apply the information through problem-solving and project-based learning (see The Flipped Classroom: A Survey of the Research). Of course, not all content is necessarily suited to self-regulation and flipped learning. Content such as demonstrations of procedures and processes, whether it be how to do an equation or how to set up a microscope, can work particularly well in this context because students can re-watch difficult or unclear sections until they have mastery. Winslett notes that video also has the potential to support accessible delivery if designed with captioning. Video can bring personalisation and a human element to the delivery of content that increases engagement. In recent research on student engagement with MOOCs, Guo et. al. studied 6.9 million video sessions to find out what made students keep watching content (2014). Among the key findings was that videos produced with a more personal feel could be more engaging than studio recordings with high production values and that including ‘talking head’ footage of the teacher increased engagement. This finding is supported by educational psychologist Richard Mayer’s concept of the ‘personalization principle’, or the idea that ‘people learn better from multimedia presentations when words are in conversational style rather than formal style’. The good news here is that you don’t require a fancy studio or huge budget to create engaging content. A video shot simply on an iPad or other device can be just as engaging if you are authentic and enthusiastic in your delivery. This can be seen in the work of UTS’s own champion of video in learning and teaching, Amanda White, whose YouTube channel AmandaLovesToAudit has over 20,000 subscribers. Amanda infuses her personality and enthusiasm into her videos to such an extent that her video on How to perform a bank reconciliation has had over 450,000 YouTube views! ‘people learn better from words and pictures than words alone’. This is based on the idea that working memory processes visual and auditory information via different channels in the brain. So a video that explains a concept using narration over meaningful imagery allows information to be assimilated via two channels, and more deeply. The flipside of this is that ‘cognitive load’ must be considered when producing educational videos. This means it’s important to keep video content focused and avoid extraneous elements such as distracting background music that will overload cognitive processing in each channel and detract from the main information being conveyed (Mayer & Moreno offer more ways to reduce cognitive load in this paper). Another way to minimise cognitive load is to keep videos chunked into short sections. Guo et. al.’s 2014 study found that shorter videos (less than 6 minutes) are much more engaging than longer ones. Video doesn’t have to be a one-way transmission of information; it can be used to facilitate discussion, interaction and collaboration, whether online or in the classroom. With the increase in interactive video and commenting/discussion functions accompanying much online video content, there are many tools available to ensure active rather than passive watching. This page shows you how to create interactive video quizzes that can be embedded into your UTSOnline subject using UTS’s Kaltura video platform. Brame shows that using guiding questions to frame the watching of video, or incorporating video into larger assessment items also increases active learning. There is a growing need for students across all disciplines to acquire literacy in digital technologies as well as an understanding of visual culture. This means being technically literate in producing visual and audio content, along with possessing the analytic skills of decoding visual messages and the creative skills of communicating visually. To this end, it’s useful to think about incorporating video and other digital content that students produce themselves, also known as Learner Generated Digital Media, into your learning activities and assessment. A growing field of research, including from UTS academics such as Matthew Kearney’s work on ‘iVideos’ and Jorge Reyna and Peter Meier’s LGDM framework (more information about the framework here), supports the improved achievement of learning outcomes when students produce their own digital content as part of learning activities or assessment. If you’re interested in creating video content to be incorporated into your teaching, the LX.lab media team can offer support and guidance. Book a consultation by logging a request ticket through ServiceConnect.